"The Institute of Electrical and Electronics Engineers (IEEE) is a professional association with its corporate office in New York City and its operations center in Piscataway, New Jersey. It was formed in 1963 from the amalgamation of the American Institute of Electrical Engineers and the Institute of Radio Engineers. Today it is the world's largest association of technical professionals with more than 400,000 members in chapters around the world. Its objectives are the educational and technical advancement ofelectrical and electronic engineering, telecommunications, computer engineering and allied disciplines." 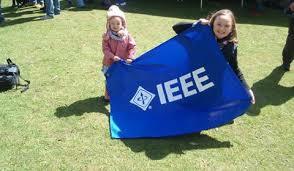 On Januaryy 8, 2015 I saw a desktop flag for the IEEE (Institute of Electrical and Electronics Engineers). The flag is a plain blue horizontal flag with the initials IEEE in white capital letters. Not only the initials, but also the emblem which is shown beside them on the tablecloth, although it is almost invisible on the photo - they all make the logo together. All of these images seem to suggest that the shade of blue is B+ or close. My flag image derived from the SVG image of the IEEE logo from Wikipedia. Logo size as in the photo of table flag (for now, the most relevant source).